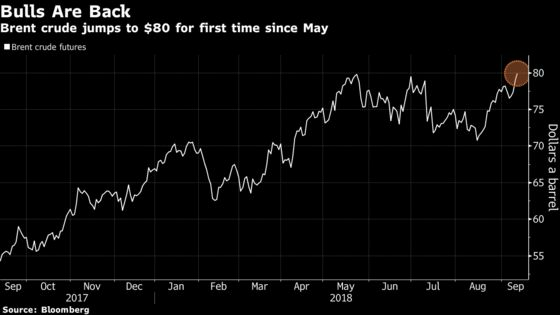 (Bloomberg) -- Crude touched $80 a barrel in London for the first time since May amid signs that global supplies are rapidly shrinking. Brent futures rose 0.9 percent on Wednesday, while the U.S. crude benchmark added 1.6 percent. U.S. efforts to isolate Iran have disrupted shipments from OPEC’s No. 3 supplier at the same time that American crude stockpiles dwindled to a 3 1/2-year low. Meanwhile, Hurricane Florence threatened East Coast fuel markets. “What you’re seeing is a tightening inventory picture from the Iranian sanctions globally,” said Nick Holmes, an analyst at Tortoise in Leawood, Kansas, which manages $16 billion in energy-related assets. As investors assessed the impact of Iranian sanctions, the unanswered question is whether mega-producers Saudi Arabia and Russia will jump in to fill supply gaps. Russia said it has the capacity to set a new oil-production record but won’t decide whether the market needs those additional supplies before a meeting later this month with its OPEC allies. West Texas Intermediate for October delivery climbed $1.12 to settle at $70.37 a barrel on the New York Mercantile Exchange, the highest in more than seven weeks. Total volume traded was about 56 percent above the 100-day average. Brent for November settlement advanced 68 cents to end the session at $79.74 a barrel on the ICE Futures Europe exchange, after earlier rising to as high as $80.13. The global benchmark traded at a $9.58 premium to WTI for the same month. Florence, which is still more than 700 miles from the coast, is expected to make landfall late Thursday or early Friday and then stall, dropping as much as 30 inches of rain on North Carolina. Gasoline futures rose 1 percent to settle at $2.0348 a gallon, the highest in more than a week. The U.S. Energy Information Administration reported Wednesday that domestic crude inventories fell by 5.3 million barrels last week partly due to a rise in exports. Meanwhile, gasoline and diesel stockpiles increased. OPEC highlighted a range of risks brewing in the global economy that could hurt oil demand as ministers prepared for a meeting on production policy, marking a shift from last month’s outlook. Iran is starting to store oil in its fleet of supertankers as U.S. pressure forces the Persian Gulf country to revive a strategy it deployed under previous curbs. America likely overtook Russia and Saudi Arabia to become the world’s biggest oil producer earlier this year, according to the EIA.